If you are coming from a very light weight Cloud CRM application (e.g. CRM On Demand) where users could only have a single role and functional privileges, data security authorizations specified in wizard based role console, Oracle Sales Cloud’s security framework could look daunting. Oracle Sales Cloud security framework has Duty Roles, Abstract Roles, Job Roles, Resource Roles and the setup/administration is done across Authorization Policy Manager (APM), Oracle Identity Manager (OIM). I would like to approach this in my own way. Now, what any of the above roles could do with these modules is defined in “policies”. These policies are of 2 types – Functional Policies and Data Security policies. These policies are grouped under Duty Roles (also called application roles). Duty roles could inherit other duty roles. This facilitates to assign multiple roles to a single user. 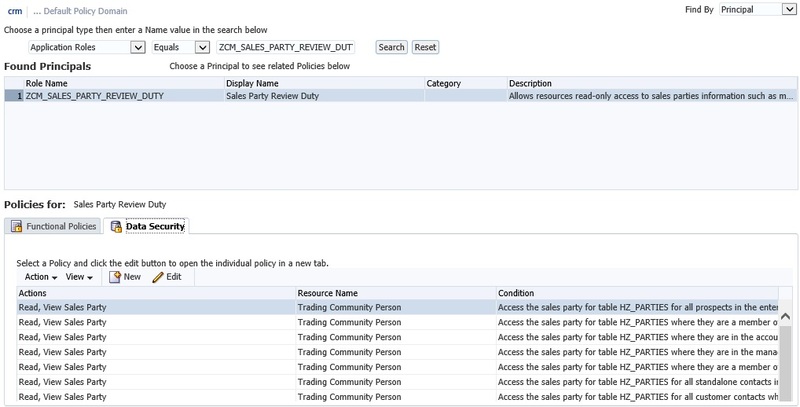 You could add or remove policies under functional policies section. You could add or remove policies and add explicit rules and actions for data security policies. Duty Roles are grouped under Job Roles & Abstract Roles (also called external roles). Job role typically represents the job a user is hired into e.g. Sales representative job. Abstract roles typically contain common functionality irrespective of job role e.g. the ‘Employee’ abstract role allows a user to manage personal information etc. During every implementation it is mandatory that we review functional and data security policies that are assigned to a user through Job roles & abstract roles and add or remove any as required by customer requirements. The seeded Sales Party review duty allows a sales representative to view all accounts and contacts in Sales Cloud application. The seeded Sales Party review duty allows a sales manager to view all accounts and contacts in Sales Cloud application. A Sales Manager can also View and Edit records if a Sales Representative reporting to him/her owns a record or in the record’s team or record is associated to a territory in sales representatives’ territory hierarchy. Sales Support is a admin role and it allows the users to help sales with their daily activities, perform sales setup/admin tasks and provide access to all sales data in the designated sales region. At this moment the job role and abstract role administration is handled in OIM (Setup and Maintenance > Manage Job Roles Task) and Duty role administration is handled in APM (Setup and Maintenance > Manage Duty Roles Task). From release 10, this would become easier as Sales Cloud is coming with a security console to create and manage roles, copy roles and compare roles through a single admin interface. Refer to this customer connect webinar for more information. This entry was posted in Cloud, modern sales, oracle cloud, oracle sales cloud, Sales Cloud and tagged cloud oracle, cloud security, CRM, modern sales, Oracle, Oracle cloud, oracle crm, Oracle Fusion CRM, oracle sales, Oracle Sales Cloud, Sales Cloud, sales cloud security. Bookmark the permalink.